Women pull out all the stops when it comes to fighting aging: eating right, working out, Botox, fillers, hair color, sleep – you name it. But the war against Father Time is usually fought from the neck up. One look at a woman’s hands and all those efforts are for naught. You’re looking at your hands now aren’t you? Happy with what you see? Ellen Sirot, the nation’s top hand model, not only wanted – but also needed – top quality hand care to perfect the tools of her trade. Nothing on the market was able to provide her with the results she demanded along with the preventative care she desired. So Sirot set out on a mission with CCA Industries to create a new category and offer women the most effective and affordable hand care possible. Hand Perfection® is the only Anti-Aging Hand Care treatment line available at mass market. The line consists of a Nourishing Day Cream and Revitalizing Night Cream which when used together, are clinically proven to help turn back the hands of time - guaranteed! The fragrance-free, non-greasy formulas go on smooth and absorb quickly for an invisible, weightless feel. There is also a Nail and Cuticle Treatment which is clinically proven to moisturize the cuticles and help improve the look and feel of the nail bed for an overall healthy and beautiful looking hand. “We dedicate so much time and effort to our faces, but then we totally neglect our hands,” explains Ellen. The skin on the hands is just as delicate as the skin around the eyes. And think of what your hands go through in a single day. It’s time to give hands the same attention as your face and body. Hand Perfection Anti-Aging Hand Care products have been specifically formulated for the unique requirements of the skin on our hands. Powered by an exclusive and proprietary “RevitaStim™ Active Complex with Olivem-1000, Peptides and Hyaluronic Acid,” Hand Perfection visibly reduces the appearance of fine lines, wrinkles and crepiness and delivers youthful radiance, improved elasticity and fullness within just 2 weeks. Drew Edell, EVP, R&D and Product Development explains, “A liquid crystal emulsion contained in the Complex closely mimics and associates with the skin’s lipid barrier. This compatibility helps to restore and maintain the skin’s natural barrier and speed delivery of the functional ingredients to the skin for maximum performance. Additionally, the inclusion of SPF 15 in the Day Cream helps protect the skin from further damage. On application there is an immediate improvement in the skin’s flexibility and appearance and within 2 weeks, signs of aging on the skin are significantly improved”. “Just as anti-aging products revolutionized the facial care market, the Hand Perfection collection will generate the same kind of excitement in the hand care market,” states Dunnan Edell, CEO – President of CCA Industries. In clinical tests, 91% of consumers were shown to have a significant improvement in the reduction of fine lines and wrinkles, skin texture and skin smoothness in just two weeks with noticeable results in as few as five days when using the Hand Perfection System. 88% had a significant improvement in the appearance of crepiness and there was a greater radiance & brightness in hands. When using the Nail and Cuticle Treatment Pen, 100% of the testers were clinically proven to have more moisturized cuticles and nails. 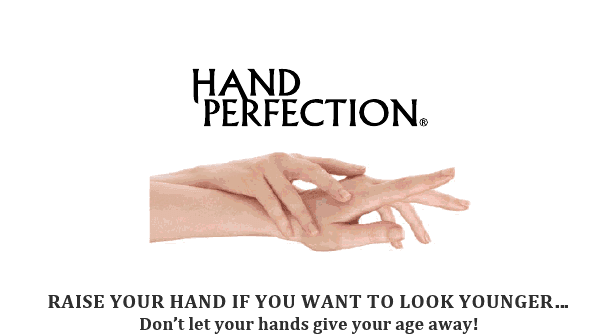 Overall, dry, aging, damaged hands were tremendously improved after using the Hand Perfection regimen. Hand Perfection is the first and only hand care system available today at mass marketers that both treats the signs of aging and works to prevent the premature aging of hands. SRP $24.99 (limited edition through March 2013). Hand Perfection will be available in January 2013 at CVS, Walgreens, Albertsons, Duane Reade, Harmon and other fine stores across the country. Please visit us at www.handperfection.com and on Facebook@HandPerfection. Hand Perfection is from CCA Industries, Inc. CCA develops, manufactures and markets high quality, innovative health and beauty care products available at fine food, drug, discount and supercenter stores everywhere. Other top brands include Nutra Nail, Bikini Zone, Plus White, Sudden Change and Shadow Shields.